Arkham Horror Third Edition is coming. How much will change compared to previous editions? Well, for now it looks like the modular game board is only the start. A new preview explains the player setup and turn. It doesn’t go into much detail, but things have changed. Things are more streamlined, in many places the rules are closer to Eldritch Horror and Mansion of Madness than old Arkham Horror. I can’t decide yet if that’s a good thing or not. The old Arkham Horror rules were convoluted in places, but the game was famous for the equally convoluted, twisted stories it produced. I hope that part is still the same. We’ll see in a future preview. 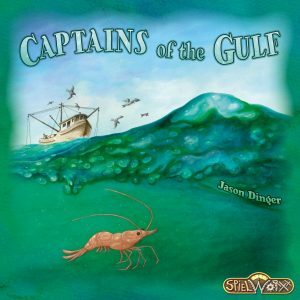 Preorders are open for Captains of the Gulf, an Essen release by Jason Dinger and Spielworxx. The titular Captains run a fishing boat in the Gulf of Mexico. They are responsible for everything: obtain fishing licenses, upgrade the boat, hire crew, and do the actual fishing. Unfortunately, all those things need the same cards. With each card played you have to decide what you want to do with it. And then there’s still the weather to consider, your money to manage, and the other players will get in your way as well. It’s going to be a stressful eight weeks this season. TMG are going to have an Essen release this year with Ghosts of the Moor by legendary designer duo Michael Kiesling and Wolfgang Kramer. In this light game players will collect treasures in the moor. When a player leaves a tile and there are no other players there they take that tile. Great if it’s treasure, not so great if it’s a ghost. Leave an empty space and you have to discard a tile. Wooden planks serve as temporary bridges and protect you from discarding. 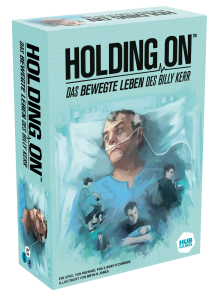 Two other new TMG releases were presented at Gen Con already, but we didn’t mention them here yet. Trade on the Tigris is a bronze age negotiation game. Each player develops a city along the Tigris to produce goods they can trade with other cities. Sets of goods turn into points. Trade is a double-edged sword, however, because it always brings some of the other cities culture. A sudden change in your cities government or religion because of that might be more than an inconvenience. That last bit sounds really interesting. Jungli-La is a dice game by Hisashi Hayashi where each player leads a jungle expedition. The dice will give you a variety of resources. Those can hire people to help your expedition with special abilities. Whoever uses their dice and helpers best will find the fabulous Village of Gold. Dungeons and wizard towers have been conquered with any shape of dice imaginable. In Kevin Wilson’s new game The Stygian Society you conquer a wizard tower using colored cubes and a wizard tower. The Stygian Society is a dice tower dungeon crawl. Players throw a bunch of cubes into the tower based on their skills, plus some more for the monsters they are facing. Not all cubes come back out immediately, some get stuck in the tower’s nooks and crannies and will fall out later when it’s least convenient. Defeating all the monsters on one floor gives you a helpful treasure before you advance to the next floor. The third floor has a mini boss, the sixth floor has the boss wizard. There’s more strategy to The Stygian Society than it sounds from the short description. When using the different skills and pieces of equipment to successfully ascend the tower your decisions are at least as important as the cubes that drop from the tower. A Feast for Odin already had an intimidating number of options to lead your vikings. Not enough, say Gernot Köpke and Uwe Rosenberg and come up with A Feast For Odin: The Norwegians. Actual Norwegians are the only thing not in the expansion. There’ll be new action boards, new buildings, new animals, new food, new places to visit… honestly, most games contain fewer things in total than this expansion adds. I’m a big fan of wizards. To me they are the main characters in any story that has them. I was fine with a game about Merlin that almost doesn’t mention Arthur. However, he is the dude that gave the whole legend his name, so he had to make an appearance. Arthur is the first expansion to Stefan Feld and Michael Rieneck’s Merlin. It replaces Merlin’s action rondell with an all new one that replaces some action and adds another action track for Arthur to walk around on. The actions there open a bunch of new options for your knights, from being presented with King Arthur’s signet ring to going out and fighting the Picts. This week’s hero preview for Plaid Hat’s Guardians introduces a pair of opposite. On the one hand, we have Harbinger, a walking tank of a hero. He’s strong, he’s tough, and once he’s deployed to a location he stays there. Neither you nor your opponent can move him. His opposite is Kosi, a highly mobile hero. She can instantly moved to an opposing hero that just took damage, and she can do damage from afar to trigger this ability. The space race would have been so much more fun with more participants. Enter Lift Off, a new game by Jeroen Vandersteen. 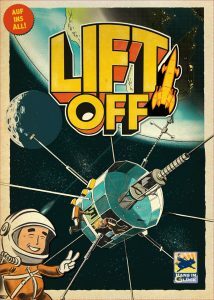 Lift Off is Jeroen’s first published game, but according to his BoardGameGeek biography he works at the European Space Agency. How cool is that? A space game designed by someone actually working at getting us there. The game is set back in the 1950s and 60s, and has the retro look to match. Players run private space agencies and compete for missions to take things into space. To that ends they hire specialists, develop rocket technology, and generally manage resources to outdo their opponents. Who knows, maybe the winner can start an alternate history in which we’re still going to space.